The first event was held in 1993 at the McNichols Sports Arena in Denver, Colorado. The purpose of the early Ultimate Fighting Championship competitions was to identify the most effective martial art in a contest with minimal rules and no weight classes between competitors of different fighting disciplines like boxing, Brazilian jiu-jitsu, sambo, wrestling, Muay Thai, karate, and judo. In subsequent events, fighters began adopting effective techniques from more than one discipline, which indirectly helped create an entirely separate style of fighting known as present-day mixed martial arts. In 2016, UFC's parent company, Zuffa, was sold to a group led by William Morris Endeavor (WME–IMG) for $4.025 billion. With a TV deal and expansion in Australia, Asia, Europe, and new markets within the United States, the UFC has increased in popularity, and has achieved greater mainstream media coverage; the promotion brought in a total revenue of US$609 million in 2015, and its next domestic media rights agreement with ESPN was valued at $1.5 billion over a five-year term. Art Davie proposed to John Milius and Rorion Gracie an eight-man single-elimination tournament called "War of the Worlds". The tournament was inspired by the Gracies in Action video-series produced by the Gracie family of Brazil which featured Gracie jiu-jitsu students defeating martial-arts masters of various disciplines such as karate, kung fu, and kickboxing. The tournament would also feature martial artists from different disciplines facing each other in no-holds-barred combat to determine the best martial art and would aim to replicate the excitement of the matches Davie saw on the videos. Milius, a noted film director and screenwriter, as well as a Gracie student, agreed to act as the event's creative director. Davie drafted the business plan and twenty-eight investors contributed the initial capital to start WOW Promotions with the intent to develop the tournament into a television franchise. In 1993, WOW Promotions sought a television partner and approached pay-per-view producers TVKO (HBO) and SET (Showtime), as well as Campbell McLaren and David Isaacs at the Semaphore Entertainment Group (SEG). Both TVKO and SET declined, but SEG – a pioneer in pay-per-view television which had produced such offbeat events as a gender versus gender tennis match between Jimmy Connors and Martina Navratilova – became WOW's partner in May 1993. SEG contacted video and film art director Jason Cusson to design the trademarked "Octagon", a signature piece for the event. Cusson remained the Production Designer through UFC 27. SEG devised the name for the show as The Ultimate Fighting Championship. WOW Promotions and SEG produced the first event, later called UFC 1, at McNichols Sports Arena in Denver, Colorado on November 12, 1993. Art Davie functioned as the show's booker and matchmaker. The show proposed to find an answer for sports fans' questions such as: "Can a wrestler beat a boxer?" As with most martial arts at the time, fighters typically had skills in just one discipline and had little experience against opponents with different skills. The television broadcast featured kickboxers Patrick Smith and Kevin Rosier, savate fighter Gerard Gordeau, karate expert Zane Frazier, shootfighter Ken Shamrock, sumo wrestler Teila Tuli, boxer Art Jimmerson, and 175 lb (79 kg) Brazilian jiu-jitsu black belt Royce Gracie—younger brother of UFC co-founder Rorion, whom Rorion handpicked to represent his family in the competition. Royce Gracie's submission skills proved the most effective in the inaugural tournament, earning him the first ever UFC tournament championship after submitting Jimmerson, Shamrock, and Gordeau in succession. The show proved extremely successful with 86,592 television subscribers on pay-per-view. It's disputed whether the promoters intended for the event to become a precursor to a series of future events. "That show was only supposed to be a one-off", eventual UFC president Dana White said. "It did so well on pay-per-view they decided to do another, and another. Never in a million years did these guys think they were creating a sport." Art Davie, in his 2014 book Is This Legal?, an account of the creation of the first UFC event, disputes the perception that the UFC was seen by WOW Promotions and SEG as a one-off, since SEG offered a five-year joint development deal to WOW. He says, "Clearly, both Campbell and Meyrowitz shared my unwavering belief that War of the Worlds[note 1] would be a continuing series of fighting tournaments—a franchise, rather than a one-night stand." With no weight classes, fighters often faced significantly larger or taller opponents. Keith "The Giant Killer" Hackney faced Emmanuel Yarbrough at UFC 3 with a 9 in (23 cm) height and 400 pounds (180 kg) weight disadvantage. Many martial artists believed that technique could overcome these size disadvantages, and that a skilled fighter could use an opponent's size and strength against him. With the 175 lb (79 kg) Royce Gracie winning three of the first four events, the UFC quickly proved that size does not always determine the outcome of the fight. During this early part of the organization, the UFC would showcase a bevy of different styles and fighters. Aside from the aforementioned Royce Gracie, Ken Shamrock, and Patrick Smith, the competitions also featured competitors such as Hall of Famer Dan Severn, Marco Ruas, Gary Goodridge, Don Frye, Kimo Leopoldo, Oleg Taktarov, and Tank Abbott. Although the first events were dominated by jiu-jitsu, other fighting styles became successful: first wrestling, then ground and pound, kickboxing, boxing, and dirty boxing, which eventually melded into modern mixed martial arts. Although UFC used the tagline "There are no rules" in the early 1990s, the UFC did in fact operate with limited rules. It banned biting and eye-gouging, and allowed techniques such as hair pulling, headbutting, groin strikes, and fish-hooking. In a UFC 4 qualifying match, competitors Jason Fairn and Guy Mezger agreed not to pull hair—as they both wore pony tails tied back for the match. That same event saw a matchup between Keith Hackney and Joe Son in which Hackney unleashed a series of groin shots against Son while on the ground. UFC 5 also introduced the first singles match, a rematch from the inaugural UFC featuring three-time champion Royce Gracie and Ken Shamrock, called "The Superfight". This proved an important development, because singles matches would feature fighters who suffered no prior damage from a previous fight in the same event, unlike tournament matches. Singles matches would become a staple in the UFC for years to come. "The Superfight" began as a non-tournament match that would determine the first reigning UFC Champion for tournament winners to face; it later evolved into a match that could feature either title matches or non-title matches. The "Superfight" would eventually completely phase out tournament matches; by UFC Brazil, the UFC abandoned the tournament format for an entire card of singles matches (aside from a one-time UFC Japan tournament featuring Japanese fighters). UFC 6 was the first event to feature the crowning of the first non-tournament UFC Champion, Ken Shamrock. The violent nature of the burgeoning sport quickly drew the attention of the U.S. authorities. In 1996, Senator John McCain (R-AZ) saw a tape of the first UFC events and immediately found it abhorrent. McCain himself led a campaign to ban UFC, calling it "human cockfighting", even sending letters to the governors of all fifty US states asking them to ban the event. Thirty-six states enacted laws that banned "no-hold-barred" fighting, including New York, which enacted the ban on the eve of UFC 12, forcing a relocation of the event to Dothan, Alabama. The UFC continued to air on DirecTV PPV, though its audience remained minuscule compared to the larger cable pay-per-view platforms of the era. In response to the criticism, the UFC increased cooperation with state athletic commissions and redesigned its rules to remove the less palatable elements of fights while retaining the core elements of striking and grappling. UFC 12 saw the introduction of weight classes and the banning of fish-hooking. For UFC 14, gloves became mandatory, while kicks to the head of a downed opponent were banned. UFC 15 saw limitations on hair pulling, and the banning of strikes to the back of the neck and head, headbutting, small-joint manipulations, and groin strikes. With five-minute rounds introduced at UFC 21, the UFC gradually re-branded itself as a sport rather than a spectacle. Led by UFC commissioner Jeff Blatnick and referee John McCarthy, the UFC continued to work with state athletic commissions. Blatnick, McCarthy, and matchmaker Joe Silva created a manual of policies, procedures, codes of conduct, and rules to help in getting the UFC sanctioned by the athletic commissions, many of which exist to this day. Blatnick and McCarthy traveled around the country, educating regulators and changing perceptions about a sport that was thought to be bloodthirsty and inhumane. By April 2000, their movement had clearly made an impact. California was set to become the first state in the U.S. to sign off on a set of codified rules that governed MMA. Soon after, New Jersey adopted the language. As the UFC continued to work with the athletic commissions, events took place in smaller U.S. markets, and venues, such as the Lake Charles Civic Center. The markets included states that are largely rural and less known for holding professional sporting events, such as Iowa, Mississippi, Louisiana, Wyoming, and Alabama. SEG could not secure home-video releases for UFC 23 through UFC 29. With other mixed martial arts promotions working towards U.S. sanctioning, the International Fighting Championships (IFC) secured the first U.S. sanctioned mixed-martial-arts event, which occurred in New Jersey on September 30, 2000. Just two months later, the UFC held its first sanctioned event, UFC 28, under the New Jersey State Athletic Control Board's "Unified Rules". As the UFC's rules started to evolve, so too did its field of competitors. Notable UFC fighters to emerge in this era include Hall of Famers Mark Coleman, Randy Couture, Pat Miletich, Chuck Liddell, Matt Hughes, and Tito Ortiz, as well as notables Vitor Belfort, Mark Kerr, Pedro Rizzo, Murilo Bustamante, Frank Shamrock, Mikey Burnett, Jeremy Horn, Pete Williams, Jens Pulver, Evan Tanner, Andrei Arlovski, and Wanderlei Silva, among others. After the long battle to secure sanctioning, SEG stood on the brink of bankruptcy, when Station Casinos executives Frank and Lorenzo Fertitta and their business partner Dana White approached them in 2000, with an offer to purchase the UFC. A month later, in January 2001, the Fertittas bought the UFC for $2 million and created Zuffa, LLC as the parent entity controlling the UFC. The UFC slowly, but steadily, rose in popularity after the Zuffa purchase, due partly to greater advertising, corporate sponsorship, the return to cable pay-per-view and subsequent home video and DVD releases. UFC 40 proved to be the most critical event to date in the Zuffa era. The event was a near sellout of 13,022 at the MGM Grand Arena and sold 150,000 pay per view buys, a rate roughly double that of the previous Zuffa events. The event featured a card headlined by a highly anticipated championship grudge match between then-current UFC Light Heavyweight Champion Tito Ortiz and former UFC Superfight Champion Ken Shamrock, who had previously left to professional wrestling in the WWE before returning to MMA. It was the first time the UFC hit such a high mark since being forced "underground" in 1997. UFC 40 also garnered mainstream attention from massive media outlets such as ESPN and USA Today, something that was unfathomable for mixed martial arts at that point in time. Many have suggested that the success of UFC 40 and the anticipation for Ortiz vs. Shamrock saved the UFC from bankruptcy; the buyrates of the previous Zuffa shows averaged a mere 45,000 buys per event and the company was suffering deep monetary losses. The success of UFC 40 provided a glimmer of hope for the UFC and kept alive the hope that mixed martial arts could become big. Beyond the rivalry itself, the success of UFC 40 was due in part to the marketing and outreach power of crossover athletes - from Pro Wrestling to MMA and MMA to Pro Wrestling - a practice with roots in Japan's Pride Fighting Championships. 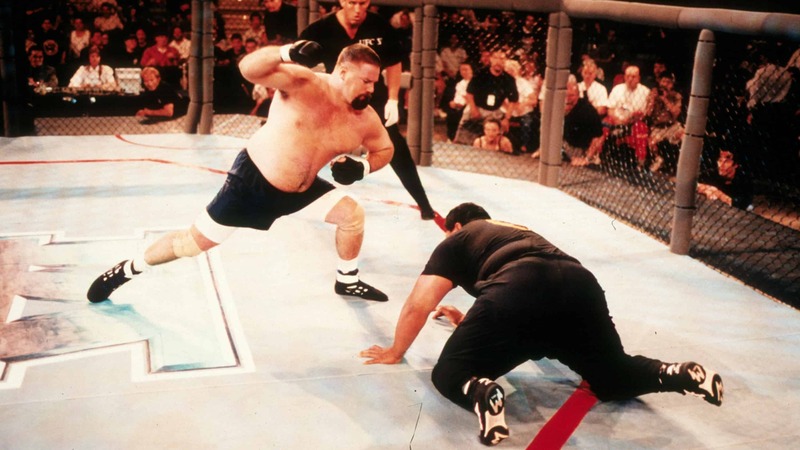 Long time UFC referee "Big" John McCarthy said that he felt UFC 40 was the turning point in whether or not the sport of MMA would survive in America. Despite the success of UFC 40, the UFC was still experiencing financial deficits. By 2004, Zuffa had $34 million of losses since they purchased the UFC. Fighters who came into prominence after Zuffa's takeover include Anderson Silva, Georges St-Pierre, Rich Franklin, B.J. Penn, Sean Sherk, Matt Serra, Ricco Rodriguez, Robbie Lawler, Frank Mir, Karo Parisyan, and Nick Diaz. Faced with the prospect of folding, the UFC stepped outside the bounds of pay-per-view and made a foray into television. After being featured in a reality television series, American Casino, and seeing how well the series worked as a promotion vehicle, the Fertitta brothers developed the idea of the UFC having its own reality series. Their idea, The Ultimate Fighter (TUF) was –a reality television show featuring up-and-coming MMA fighters in competition for a six-figure UFC contract, with fighters eliminated from competition via exhibition mixed martial arts matches. It was pitched to several networks, each one rejecting the idea outright. Not until they approached Spike TV, with an offer to pay the $10 million production costs themselves, did they find an outlet. In January 2005, Spike TV launched The Ultimate Fighter 1 in the timeslot following WWE Raw. The show became an instant success, culminating with a notable season finale brawl featuring light heavyweight finalists Forrest Griffin and Stephan Bonnar going toe-to-toe for the right to earn the six-figure contract. The live broadcast of the season finale drew a very impressive 1.9 overall rating. Dana White credits TUF 1 for saving the UFC. On the heels of the Griffin/Bonnar finale, a second season of The Ultimate Fighter launched in August 2005, and two more seasons appeared in 2006. Spike and the UFC continued to create and air new seasons until the show moved to FX in 2012.ref>UFC and Spike TV Announce Continued Partnership[permanent dead link]. UFC.com. March 22, 2006. After a very successful run on Spike and with the upcoming announcement of the UFC's new relationship with Fox, Spike officials made a statement regarding the end of their partnership with the UFC, "The Ultimate Fighter season 14 in September will be our last... Our 6-year partnership with the UFC has been incredibly beneficial in building both our brands, and we wish them all the best in the future." With the announcement of UFC's partnership with Fox in August 2011, The Ultimate Fighter, which entered its 14th season in that September, moved to the FX network to air on Friday nights starting with season 15 in the Spring of 2012. Along with the network change, episodes are now edited and broadcast within a week of recording instead of a several-month delay, and elimination fights are aired live. With increased visibility, the UFC's pay-per-view buy numbers exploded. UFC 52, the first event after the first season of The Ultimate Fighter featuring eventual-UFC Hall of Famer Chuck "The Iceman" Liddell avenging his defeat to fellow eventual-Hall of Famer Randy Couture, drew a pay-per-view audience of 300,000, doubling its previous benchmark of 150,000 set at UFC 40. Following the second season of The Ultimate Fighter, the UFC's much-hyped match between Liddell and Couture drew an estimated 410,000 pay-per-view buys at UFC 57. The surge in popularity prompted the UFC to beef up its executive team. In March 2006, the UFC announced that it had hired Marc Ratner, former Executive Director of the Nevada Athletic Commission, as Vice President of Regulatory Affairs. Ratner, once an ally of Senator McCain's campaign against no holds barred fighting, became a catalyst for the emergence of sanctioned mixed martial arts in the United States. Ratner lobbied numerous athletic commissions to help raise the UFC's media profile in an attempt to legalize mixed martial arts in jurisdictions inside and outside the United States that had yet to sanction the sport. In December 2006, Zuffa acquired the northern California-based promotion World Extreme Cagefighting (WEC) in order to stop the International Fight League (IFL) from making a deal with Versus (now NBC Sports Network). At the time, the UFC had an exclusive deal with Spike, so the purchase of the WEC allowed Zuffa to block the IFL from Versus without violating their contract. The WEC showcased lighter weight classes in MMA, whereas the UFC featured heavier weight classes. Notable WEC fighters included Urijah Faber, Jamie Varner, Carlos Condit, Benson Henderson, Donald Cerrone, Anthony Pettis, Eddie Wineland, Miguel Angel Torres, Mike Thomas Brown, Leonard Garcia, Brian Bowles, Dominick Cruz, and José Aldo. In December 2006, Zuffa also acquired their cross-town, Las Vegas rival World Fighting Alliance (WFA). In acquiring the WFA, they acquired the contracts of notable fighters including Quinton Jackson, Lyoto Machida, and Martin Kampmann. The sport's popularity was also noticed by the sports betting community as BodogLife.com, an online gambling site, stated in July 2007 that in 2007 UFC would surpass boxing for the first time in terms of betting revenues. In fact, the UFC had already broken the pay-per-view industry's all-time records for a single year of business, generating over $222,766,000 in revenue in 2006, surpassing both WWE and boxing. On March 27, 2007, the UFC and their Japan-based rival the Pride Fighting Championships announced an agreement in which the majority owners of the UFC, Frank and Lorenzo Fertitta, would purchase the Pride brand. Initial intentions were for both organizations to be run separately but aligned together with plans to co-promote cards featuring the champions and top contenders from both organizations. However, after purchasing Pride, Dana White felt that the Pride model was not sustainable and the organization would likely fold with many former Pride fighters such as Antônio Rodrigo "Minotauro" Nogueira, Maurício "Shogun" Rua, Dan Henderson, Mirko "Cro Cop" Filipović, Wanderlei Silva, and others already being realigned under the UFC brand. On October 4, 2007, Pride Worldwide closed its Japanese office, laying off 20 people who were working there since the closing of its parent company Dream Stage Entertainment (DSE). On June 18, 2008, Lorenzo Fertitta accommodated the UFC's growth by announcing his resignation from Station Casinos in order to devote his energies to the international business development of Zuffa, particularly the UFC. The move proved to be pivotal, as Fertitta helped strike TV deals in China, France, Mexico, and Germany as well as open alternative revenue streams with a new UFC video game and UFC action figures, among other projects. Fighters exposed to the UFC audience—or who became prominent—in the post-Pride era include Anderson Silva, Jon Fitch, Lyoto Machida, Cain Velasquez, and Jon Jones, among others. Popularity took another major surge in 2009 with UFC 100 and the 10 events preceding it including UFC 90, 91, 92, 94, and 98. UFC 100 was a massive success garnering 1.6 million buys under the drawing power of former NCAA wrestling champion Brock Lesnar and his rematch with former UFC Heavyweight Champion Frank Mir, Canadian Georges St-Pierre going head-to-head with Brazilian  Thiago Alves, and American Dan Henderson opposing British Michael Bisping at middleweight after the two were rival coaches on The Ultimate Fighter: United States vs. United Kingdom. UFC 100 was unique in that it drew significant interest from ESPN, which provided extensive coverage of the event in the days preceding and following it. In fact, ESPN would eventually devote additional coverage of the UFC and other MMA news with the television debut of MMA Live on ESPN2 in May 2010. However, the momentum gradually began to pick up in the first quarter of 2010 after victories from defending champions Georges St-Pierre and Anderson Silva, as well as Lyoto Machida's first career defeat to "Shogun" Rua for the UFC Light Heavyweight title. These fights segued into a very popular clash between former UFC Champions and rivals Rashad Evans and Quinton Jackson—rival coaches on The Ultimate Fighter 10: Heavyweights—at UFC 114, featuring the UFC's first main event headlined by black fighters. The event scored over 1 million pay per view buys as Evans secured a unanimous decision victory. After a dramatic fifth round, last minute victory by UFC Middleweight Champion Anderson Silva over Chael Sonnen at UFC 117, Lesnar finally surrendered his belt to the undefeated Cain Velasquez via 1st-round TKO at UFC 121. The fight produced Velasquez's eighth knockout or technical knockout in his first nine MMA fights. On November 5, 2016 the UFC had their first exhibition in New York City after years of being delayed by government officials and red tape with a dramatic first match, Conor McGregor vs. Eddie Alvarez. Zuffa, the parent company of the UFC, purchased World Extreme Cagefighting in late 2006 and held the first WEC event under new ownership on January 20, 2007. Soon thereafter the WEC made its home on the Versus Network with its first event debuting on that network in June 2007. On October 28, 2010, Zuffa announced that WEC would merge with the UFC. The WEC held its final card on December 16, 2010. As a result of the merger, the UFC absorbed WEC's bantamweight, featherweight and lightweight weight divisions and their respective fighters. The UFC also made the last WEC Featherweight and Bantamweight Champions, José Aldo and Dominick Cruz respectively, the inaugural UFC Champions of their new weight divisions. Reed Harris, who started World Extreme Cagefighting with Scott Adams, had mixed emotions on the merger. "It's kind of like when your kid goes off to college: at first you're not happy, but after you think about it for a while, you're really happy," Harris told MMAWeekly.com in an exclusive interview immediately following the announcement. "At the end of the day, I never imagined this thing would be where we're at today. I'm extremely proud and happy that I was involved with something that will now be part of what may be, some day, the largest sports organization in the world." On March 12, 2011, Dana White revealed that Zuffa had purchased Strikeforce. White went on to explain that Strikeforce will operate as an independent promotion, and that Scott Coker will continue to run the promotion. Strikeforce CEO Scott Coker announced the return of Fedor Emelianenko on an unspecified July or August event and said that Zuffa-owned company would continue to co-promote with M-1 Global. Following the purchase, the UFC signed many of Strikeforce's top stars and champions, such as Jason Miller, Nick Diaz, Dan Henderson, Alistair Overeem, and Cung Le. Under Zuffa's ownership, Strikeforce made minor changes, including adopting the Unified Rules of Mixed Martial Arts in full, closing the promotion's men's weight classes below lightweight, and ceasing promotion of amateur undercard bouts. After an extension was reached to continue Strikeforce through 2012, the promotion's heavyweight division (sans Heavyweight Grand Prix finalists) was merged into the UFC, and the promotion's Challengers series was ended. The final Strikeforce show was Strikeforce: Marquardt vs. Saffiedine on January 12, 2013, after which the promotion was dissolved and all fighter contracts were either ended or absorbed into the UFC. On August 18, 2011, The Ultimate Fighting Championship and Fox announced a seven-year broadcast deal through the Fox Sports subsidiary, effectively ending the UFC's Spike TV and Versus (now NBC Sports Network) partnership. The deal includes four events on the main Fox network, 32 live Friday night fights per year on their cable network FX, 24 events following The Ultimate Fighter reality show and six separate Fight Night events. The promotion's first broadcast television event – UFC on Fox: Velasquez vs. dos Santos – broke form by showcasing only one fight to television viewers. In the main event, Junior dos Santos abruptly dethroned then-undefeated UFC heavyweight champion Cain Velasquez by knock-out at 1:04 in the first round. The telecast peaked with 8.8 million viewers tuning into the fight with an average audience of 5.7 million, making it by far the most watched MMA event of all-time and the most watched combat sports event since 2003's HBO bout between Lennox Lewis and Vitali Klitschko. One of the other programming opportunities that emerged was a weekly UFC magazine-style show. When asked about the potential for a weekly magazine-style series, UFC CEO Lorenzo Fertitta responded, "Not only weekly, but, potentially, multiple times per week you'll have a UFC magazine (show)." The UFC maintained production control of its product, including the use of its broadcast team of Mike Goldberg and Joe Rogan. Fox Sports produced the pre- and post-shows. Ronda Rousey was the first female UFC champion. She defended her 135-pound Bantamweight Championship from March 3, 2012 to November 15, 2015. On November 16, 2012, the eve of UFC 154: St. Pierre vs. Condit, Dana White confirmed with Jim Rome the UFC would feature women's MMA with the signing of its first female fighter, Strikeforce bantamweight champion Ronda Rousey. She subsequently became the first female UFC champion, the first Olympic medalist with a UFC title, and the first woman to defend a UFC title. She would successfully defend her title six times over a grand total of 1,074 days, before she was defeated by Holly Holm on November 15, 2015, at UFC 193. On December 11, 2013, the UFC purchased the contracts of 11 female fighters from Invicta Fighting Championships to launch their 115-pound Strawweight division. Eight of the Invicta fighters took part in the 20th season of The Ultimate Fighter, The Ultimate Fighter: Team Pettis vs. Team Melendez, along with eight additional fighters signed up for the tournament via open tryouts. Season winner, Invicta FC's Strawweight Champion, Carla Esparza became the first UFC women's strawweight champion, defeating Rose Namajunas in the finale. Other fighters on the show included Felice Herrig, Tecia Torres, Bec Hyatt, Randa Markos, Jessica Penne, and Joanna Jędrzejczyk. The first UFC event to be held outside the contiguous United States was UFC 8 in Puerto Rico, a US territory, in 1996. Subsequently, the UFC has visited 15 countries in Asia, Europe, Oceania, South America, and North America. Canada has hosted events 18 times, starting with UFC 83 in 2008 and most recently in 2015 with UFC 186. UFC's biggest event to date was also in Canada, as UFC 129 held at Rogers Centre featured a record-breaking attendance of 55,724. The United Kingdom has been home to 16 events. The first was UFC 38 held in London in 2002. UFC returned to the United Kingdom in 2007 with UFC 70, and visited Northern Ireland for UFC 72. The UK's most recent event was at England with UFC 204 in 2016. Ireland has held UFC 93 in 2009 and UFC Fight Night: McGregor vs. Brandao 5 years later. In continental Europe, Germany has hosted 5 times, the first being UFC 99 in 2009, UFC 122 in 2010, UFC Fight Night: Munoz vs. Mousasi in 2014, UFC Fight Night: Jędrzejczyk vs. Penne in 2015 and the latest was UFC Fight Night: Arlovski vs. Barnett in 2016. Sweden has hosted 3 times, starting with UFC on Fuel TV: Gustafsson vs. Silva in 2012, and recently with UFC on Fox: Gustafsson vs. Johnson in 2015. Poland had its first event with UFC Fight Night: Gonzaga vs. Cro Cop 2 in 2015. There are also Fight Night events due to take place in 2016, in Rotterdam, Netherlands and Zagreb, Croatia. The first Brazilian event was UFC Brazil: Ultimate Brazil, held in São Paulo in 1998. The promotion did not return to Brazil until 2011 for UFC 134, but since then, the country has hosted a further 20 events. Their most recent visit was UFC Fight Night: Condit vs. Alves. In 2014, Mexico became the second country in Latin America to host an event with UFC 180, followed by a second event, UFC 188, in 2015. Seven UFC events have been held in Australia, beginning with UFC 110 in 2010 and most recently in December 2018 with UFC Fight Night 142. New Zealand held its first event in 2014, UFC Fight Night: Te Huna vs. Marquardt. In Asia, the UFC has visited 5 countries. Japan had its first visit in 1997 for UFC Japan: Ultimate Japan. The UFC only returned to the country in 2012, with UFC 144. Their last visit was in 2014 for UFC Fight Night: Hunt vs. Nelson, the seventh event there. The promotion has also featured 2 visits to the United Arab Emirates. The first was in 2010 for UFC 112 and the second in 2014 for UFC Fight Night: Nogueira vs. Nelson. The promotion has also visited Macau in 3 occasions: China's special administrative region was first visited in 2012 with UFC on Fuel TV: Franklin vs. Le and last visited in 2014 for UFC Fight Night: Bisping vs. Le. The promotion has also visited Singapore with UFC Fight Night: Saffiedine vs. Lim in 2014. The Philippines was the most recent Asian country that the UFC has visited, with UFC Fight Night: Edgar vs. Faber in 2015. The Ultimate Fighter has had international editions as well: Brazil (since 2012), Australia (vs. United Kingdom - 2012), China (2013), Canada (vs. Australia - 2014), and Latin America (2014). On February 27, 2014, the Nevada State Athletic Commission banned the use of Testosterone Replacement Therapy (TRT). The UFC followed suit and banned the use of TRT for any of their events, including international markets where the UFC oversees regulatory efforts. In December 2014, an antitrust lawsuit was filed against Zuffa by several fighters, claiming the organization restricts fighters' control over their careers and earning potential. Throughout 2015, debate over venues and possible case dismissals ensued. Ultimately, the case moved to Nevada federal courts, where Zuffa was denied its motion to stay discovery for 15 years of its financial records. This has caused an ongoing debate and struggle over how UFC sensitive information should be handled, and who may view it. Especially concerning MMAFA founder, Rob Maysey who has taken the lead in representing the former athletes and has stated he hopes to achieve reforms similar to the Ali Act (2000). Later that year, a 12–16 month investigation began that is expected to last until sometime between September 2016 to January 2017. Thus far, both sides have provided well over 100,000 documents. In May 2016, ESPN originally reported that the UFC's parent company Zuffa, LLC was in talks to sell the company for $3.5 billion to $4 billion. (In 2015, the UFC had a reported EBITDA of $200–250 million.) Because it was a privately owned company, no official comment was made from the UFC or Dana White regarding the sale. Companies initially interested in the sale were Dalian Wanda Group, China Media Capital, and WME–IMG (Endeavor). On July 9, 2016, it was officially announced that the UFC would be sold to a group led by WME–IMG, its owner Silver Lake Partners, Kohlberg Kravis Roberts, and MSD Capital, for $4.025 billion. At the time, it marked the largest-ever acquisition in sports. Lorenzo Fertitta stated that the new ownership, "with whom we've built a strong relationship over the last several years, is committed to accelerating UFC's global growth", and that they "share the same vision and passion for this organization and its athletes." Flash Entertainment (owned by the government of Abu Dhabi) will retain its 10% minority stake in the company. White, who owned 9% of the UFC, stayed, having been given a stake in the new business. Shortly after the sale, it was announced that White would remain president. As a result of the sale, Fertitta stepped down as chairman and CEO. WME-IMG was renamed Endeavor in September 2017. In October 2016, MMAJunkie obtained an UFC financial report released by Endeavor, detailing that the promotion had reached a year-to-year high of $609 million in revenue during 2015. 76% of the total was credited to "content" revenue, covering media rights, PPV buys and UFC Fight Pass subscriptions; in turn, 42% of content revenue was credited to pay-per-view buys, followed by U.S. and international media rights. In May 2018, UFC reached new U.S. media rights deals with Disney Direct-to-Consumer and International and ESPN Inc., succeeding those with 21st Century Fox, which began in January 2019. The five-year contracts are cumulatively valued at $300 million per-year for digital and linear rights, roughly doubling the amount paid by Fox in the final year of its previous contract, and include 42 events on ESPN platforms per-year. ESPN linear networks will televise preliminary cards for UFC PPV events, and 10 UFC on ESPN Fight Night events per-year. The subscription streaming service ESPN+ will broadcast 20 exclusive events per-year under the branding UFC on ESPN+ Fight Night; regardless of network, all Fight Night events will feature a full, 12-fight card, and their preliminaries will air exclusively on ESPN+. The ESPN+ service will also hold on-demand rights to UFC library and archive content, new seasons of Dana White's Contender Series, and other new original content. UFC Fight Pass will be purchasable as an add-on for ESPN+ to stream pay-per-view events. On March 18, 2019, it was announced that ESPN had reached a two-year extension of the contract. In addition, it was announced that in the United States, future UFC PPVs will only be sold through ESPN+ to its subscribers, and will no longer be sold via traditional television providers beginning with UFC 236. At the same time, the standard price for UFC PPVs was lowered to $59.99 (from $64.99), and new subscribers will also be able to purchase a bundle of a UFC PPV and a year of ESPN+. On July 18, 2018, it was announced that UFC has entered into a partnership with Russian MMA promoter M-1 Global. M-1 Global will serve as a farm league to scout Russian fighters for UFC and will participate in organizing UFC events in Russia. The deal also gives M-1 champions the opportunity to sign with UFC. On September 15, 2018, the first UFC event in Russia was held at the Olympic Stadium in Moscow. On June 3, 2015, the UFC announced their intent to enter into a joint partnership with the United States Anti-Doping Agency (USADA) on implementing an anti-doping program. In September 2018, the UFC changed its policy on failed drug tests, granting fighters the ability to go through an adjudication process before any violations are publicly announced. This came after several cases of fighters, such as Anderson Silva, Junior dos Santos, Josh Barnett and Cris Cyborg, being flagged for potential doping violations, but cleared after they were proved of unintentional use of performance enhancing drugs (usually in the form of contaminated supplements). The current rules for the Ultimate Fighting Championship were originally established by the New Jersey Athletic Control Board. The set of "Unified Rules of Mixed Martial Arts" that New Jersey established has been adopted in other states that regulate mixed martial arts, including Nevada, Louisiana, and California. These rules are also used by many other promotions within the United States, becoming mandatory for those states that have adopted the rules, and so have become the standard de facto set of rules for professional mixed martial arts across the country. UFC matches vary in maximum length, depending on whether the match is for a Championship title, or is a fight card's "main event" fight. In all fights, each round can be no longer than five minutes. Championship fights last for a maximum of five rounds. Beginning with UFC 138 on November 5, 2011, non-championship "main event" fights (i.e. the final fight on the card) will also last for a maximum of five rounds. Non-main event bouts last for a maximum of three rounds. UFC on FX: Alves vs. Kampmann featured the organization's first two flyweight fights as part of its first flyweight tournament, which consists of bouts that, in the event of a draw, go to a fourth "sudden victory" round held to determine the winner, who advances. There is a one-minute rest period between rounds. Shot of the Octagon as Chris Weidman upsets Anderson Silva at UFC 162. The UFC stages bouts in an eight-sided enclosure officially named "The Octagon". Originally, SEG trademarked the concept as well as the term and prevented other mixed martial arts promotions from using the same type of cage, but in 2001 Zuffa gave permission for other promotions to use octagonal cages, reasoning that the young sport needed uniformity to continue to win official sanctioning. Today Zuffa reserves exclusive use of the name "The Octagon". The UFC cage is an octagonal structure with walls of metal chain-link fence coated with black vinyl. The standard octagon has a diameter of 30 ft (9.1 m) with a 6 ft (1.8 m) high fence. The cage sits atop a platform, raising it 4 ft (1.2 m) from the ground. It has foam padding around the top of the fence and between each of the eight sections. It also has two entry-exit gates opposite each other. The mat, painted with sponsorship logos and art, is replaced for each event. For smaller venues and events, the UFC often uses a smaller cage, which is only 25 ft (7.6 m) across. All competitors fight in approved shorts, without shoes. Tops are only approved for female competitors. Required safety equipment include padded gloves, mouthguard, and protective cups held in place with a jockstrap for males. The open-fingered gloves have at least 1" of padding around the knuckles, (110 to 170 g / 4 to 6 ounces) that allow fingers to grab. To ensure compliance, fighters are checked by a State Athletic Committee official before being allowed to enter the cage/ring. Originally the attire for UFC was very open. Many fighters still chose to wear tight-fitting shorts or boxing-type trunks, while others wore long pants or singlets. Several wore wrestling shoes. Multi-time tournament Champion Royce Gracie wore a Brazilian jiu-jitsu gi in all of his early appearances in UFC (Gracie wore shorts against Matt Hughes at UFC 60), while Art Jimmerson appeared in UFC 1 wearing one standard boxing glove. As of UFC 133 there has been a ban on speedo style shorts after Dennis Hallman wore one in his fight against Brian Ebersole. UFC president Dana White was so furious about the fighter's choice of attire that he awarded an honorary "getting those horrifying shorts off TV as soon as possible" bonus to Ebersole for finishing the fight in the first round, and in following post-fight interviews made it clear that speedo style shorts will no longer be tolerated. On December 2, 2014, the UFC and Reebok held a press conference to announce an exclusive deal for Reebok to become the worldwide outfitter for the UFC, beginning in July 2015. Financial terms of the six-year partnership were not released, but UFC officials said that though the agreement represents the most valuable non-broadcast contract the company has ever signed, the UFC will not directly profit from the new deal. Instead, company execs said the deal is structured so that the "vast majority of the revenue" from the deal – taking out only the costs associated with administering the new program – will be paid directly to UFC fighters. Payment on the new deal was originally expected to be based on the fighter's spot in the official UFC rankings, with the exception of the UFC champions. Fighters ranked No. 1 to 5 would be paid at one level, No. 6 to 10 at a lower level, No. 11 to 15 below that, and unranked fighters at a base rate. The payments would remain consistent regardless of where the athletes' bouts air. In addition to the per-fight rate, fighters would also receive royalty payments representing 20 percent of any UFC merchandise sold that bears their likeness. The royalty program would also include retired fighters and continue in perpetuity. The deal itself was reported to be worth 70 million dollars which was what the fighters would be paid over the next six years which is roughly 260 thousand dollars per UFC fight card. In April 2015, the UFC announced that they scrapped the rankings idea and that payment will be based on the fighter's number of bouts in the octagon, with different tiers (1-5 fights, 6-10 fights, 11-15 fights, and 16-20 fights). Exceptions are made in the event of title fights, with champions and title challengers receiving greater compensation. The kits were revealed on June 30, 2015. All kits feature the fighter's name on the back of the jersey and fighters have the option to choose between a universal kit or a country kit, related to his nationality. There is also a champion kit, designed to be used only by title holders. The new deal meant that beginning with fight week for UFC 189 in Las Vegas, existing sponsors no longer appear on fighter clothing – not only on fight night, but also at all pre-fight media appearances – and in-cage sponsor banners have also eliminated. Fighter camps are outfitted with approved clothing to create a uniform look in athletes' corners. Existing sponsors are still welcome to support UFC fighters. However, third-party logos are no longer allowed on UFC broadcasts, other than title-sponsor slots – similar to those seen with European soccer clubs – that the UFC may eventually sell to "a major, global brand" down the road. In the event of a draw, it is not necessary that the fighters' total points be equal (see, e.g., UFC 41 Penn vs. Uno, or UFC 43 Freeman vs. White). However, in a unanimous or split draw, each fighter does score an equal number of win judgments from the three judges (0 or 1, respectively). Additionally, if a title fight ends in a draw, the defending champ retains the title. The ten-point must system is in effect for all UFC fights; three judges score each round and the winner of each receives ten points while the loser receives nine points or fewer (although 10–10 rounds are given in the rare event that a judge feels the rounds was too close to warrant giving one fighter 10 and the other 9.) Scores of 10–8 are typically awarded for dominant rounds and anything more dominant is scored less. 10–7 rounds are very rare. UFC 2 – Groin attacks were unbanned. Time limits were dropped ending the need for judges. Modifications to the cage were added (the fence became 5 feet tall but would continually grow in height afterwards and the floor became the canvas that is still used today). UFC 12 – The main tournament split into a heavyweight (over 200 lbs.) and lightweight (200 lbs. and under) division; and the eight-man tournament ceased. Fighters now needed to win only two fights to win the competition. The Heavyweight Champion title (and title bouts) was introduced, replacing the Superfight title (albeit matches were still for a time branded as "Superfights"). UFC 14 – The lightweight division was re-branded middleweight. The wearing of padded gloves, weighing 110 to 170 g (4 to 6 ounces), becomes mandatory. Gloves were to be approved by the UFC. Hair-pulling, groin strikes and kicks to a downed opponent became illegal. UFC 15 – Limits on permissible striking areas were introduced. Headbutts, elbow strikes to the back of the neck and head and small joint manipulation became illegal. UFC 28 – The New Jersey State Athletic Control Board sanctions its first UFC event, using the newly developed Unified Rules of Mixed Martial Arts. Major changes to the UFC's rules included barring knee strikes to the head of a downed opponent, elbow strikes to the spine and neck and punches to the back of the neck and head. Limits on permissible ring attire, stringent medical requirements, and regulatory oversight were also introduced. A new weight class system was also introduced. This new set of rules is currently the de facto standard for MMA events held in the U.S. and is still in use by the UFC. UFC 31 – Weight classes are re-aligned to the current standard. Bantamweight moves from 150 to 155 and becomes known as lightweight. Lightweight becomes known as welterweight, middleweight becomes light heavyweight, and a new middleweight class is introduced at 185 pounds. Stools and seconds are first permitted in The Octagon between rounds. UFC 94 – After an incident where Georges St-Pierre was accused of putting vaseline on his back, corner men were disallowed from bringing vaseline into The Octagon. Petroleum jelly may now only be applied by UFC employed cutmen. Fights that occur on The Ultimate Fighter are classified as exhibition matches under NSAC sanctioning, and thus do not count toward the professional record of a fighter. Match outcomes also do not need to be immediately posted publicly, which allows for fight results to remain unknown to the public until the airdate of the episode. For two-round matches, if there is a draw after two rounds, an extra five-minute round ("sudden victory") is contested. If the extra round concludes without a stoppage, the judges' decision will be based on that final round. These exhibition matches variably have two or three rounds, depending on the rules used for each season. In most seasons, preliminary matches (before the semi-final bouts) were two rounds; in season two, all matches had three rounds. All matches past the first round use three rounds as per standard UFC bouts. During the finales for each series, the division finals have the standard three rounds, plus a fourth round if the judges score a tie. Non-title fights have a one-pound leniency. In title fights, the participants must weigh no more than that permitted for the relevant weight division. The Commission may also approve catch weight bouts, subject to their review and discretion. For example, the Commission may still decide to allow the contest the maximum weight allowed is 177 pounds if it feels that the contest would still be fair, safe, and competitive. In addition, there are five weight classes specified in the Unified Rules which the UFC does not currently use: Super Lightweight (165 pounds), Super Welterweight (175 pounds), Super Middleweight (195 pounds), Cruiserweight (225 pounds), and Super Heavyweight (>265 pounds). MMA journalists and fans have criticized the UFC for putting on too many shows and thus diluting the quality of their product. Comedian, Brazilian jiu-jitsu and Taekwondo black belt Joe Rogan teams up with play-by-play announcer Jon Anik to provide commentary during broadcasts of most UFC events in the US. For 20 years Joe Rogan and Mike Goldberg provided commentary at live events. The "Veteran Voice of the Octagon" is announcer Bruce Buffer. Arianny Celeste, Rachelle Leah, Brittney Palmer, Carly Baker, Vanessa Hanson, Chrissy Blair, Jhenny Andrade, Camila Oliveira, Luciana Andrade, Jamilette Gaxiola, and Red Dela Cruz are Octagon girls. Each fighter is assigned a cutman by the promotion who cares for the fighter before the fight and in between rounds. Jacob "Stitch" Duran was one of the best known cutmen working for the organization. Matches are made by matchmakers, and VP of Talent Relations, Joe Silva and Sean Shelby. UFC fighters are paid per fight, with amounts depending on how well-known the fighters are and how well sponsored a fighter and an event is. Fighters will typically get paid money to fight, called show money, with an additional bonus if they win, called a win bonus. Despite not being officially confirmed by the UFC, Justin Gaethje revealed in January 2019 that headlining an event nets additional $25,000 per fighter. While fighters new to the UFC can make as little as about $10,000 per fight (without a win bonus), more established fighters have made as much as $500,000 to $1 million per fight. Occasionally, fighters will earn more. For example, at UFC 202, Conor McGregor made a reported $3 million, a UFC record for one fight, while his opponent Nate Diaz made a reported $2 million. The combined $5 million made between the fighters was the largest combined fight purse in UFC history. Cash bonuses are also awarded for "Fight of the Night" and "Performance of the Night" (formerly awarded separately as "Knockout of the Night"). The size of these bonuses can sometimes be $80,000 USD (but are normally $50,000 USD). For less well-known fighters, they can be several times larger than the contracted amount for the fight. Contracted amounts generally have to be declared to the state athletic commission; however, the UFC also pays undisclosed locker-room bonuses to fighters. In recent years, UFC fighters' contracts and merchandising rights have been the subject of dispute between fighters (represented by growing the Mixed Martial Arts Fighters Association) and UFC, which has attempted to defend existing regulations. UFC is contractually bound to offer every fighter three fights per calendar year and if they don't, the organization has to pay the fighter for the lacking fights. In example, if the UFC offers a fighter only one fight during the year, they have to pay the fighter for two additional fights. However, if a fight is offered but turned down by the fighter, it is still counted as an offered fight from the contractual viewpoint. Friends Season 3, Episode 24 "The One with the Ultimate Fighting Champion" is based around the UFC and features Jon Favreau as Pete Becker, Monica's millionaire boyfriend who seeks to become the "Ultimate Fighting Champion," losing his first fight due to his opponent "standing on [his] neck," and the second to a man who "Trains by traveling to Iran and pulling the arms off of thieves." In his third fight Pete loses to a fighter who "goes for his favorite area," causing Ross to note Pete can no longer have kids. In January 2007, Zuffa and video game developer/publisher THQ announced a license agreement giving THQ worldwide rights to develop titles under the UFC brand. The agreement gives THQ exclusive rights to current and next-generation consoles as well as to PC and handheld titles. Also included are "certain wireless rights" which were not detailed. The licensing agreement was set to expire in 2011, although it appeared to have been extended to 2017. On June 6, 2012, during the E3 Exhibition, THQ had announced that they will be giving the license of UFC Undisputed to EA. The first UFC action figure collectibles were released by Round 5 Corporation in May 2008. Series one of their figures includes Quinton "Rampage" Jackson, Matt Hughes, Tito Ortiz, and Randy Couture. Series two (released on November 10, 2008) includes Wanderlei Silva, Sean Sherk, Rich Franklin, and Anderson Silva. On June 10, 2008, it was announced that UFC had signed an exclusive four-year contract with Jakks Pacific to create action figures for UFC. As of 2009 the schedule envisages the release of these figures in November 2009. They have currently been 8 series released and they feature special Legends, Pride, and WEC style figures as well. Three 2 packs series have also been released, as well as several expo and internet exclusives. There are also several different octagon cage playsets that have been released, including the "Octagon Playset", "Official Scale Octagon Playset", and "Electronic Reaction Octagon Playset". A Pridestyle ring playset was also originally planned; however, no news have been given on its status or release date since then. Every pay-per-view UFC event has been released onto DVD. UFC 23 through UFC 29 were not released in the US on home video or DVD by SEG. They have since been released onto boxsets which feature around 10 events each set, in chronological order. UFC on-demand content launched for Xbox 360 on December 20, 2011. Subscribers are able to view pay-per-view events in high definition, connect with friends to predict fight results, and have the ability to compare fighter statistics and records. The UFC Fight Pass application was also planned for PlayStation 4 in early 2015. The UFC's PPV events are broadcast live on PPV USA and BT Sport in the UK. Latin America, events are broadcast live on Fighting Sports Network in Pay TV (Cable and Satellite) of SKY Satellite. Free TV Channels in Mexico, Fox Sports 2 and Fox Premium in Pay TV (Cable and Satellite) South America and Central America are broadcast with tape-delay. In Brazil, events are broadcast live on Combate Channel from Globosat. Rede Globo's are broadcast tape-delayed from 12:00 am. In Southeast Asia (exclude the Philippines), Hong Kong, and Papua New Guinea, UFC events are broadcast on Fox Movies Premium (2012-2013)  and Fox Sports  (2013-now). In India, events are broadcast on Sony Six. In the Philippines, UFC was also aired on Balls (now ABS-CBN Sports + Action HD) from 2009 until 2015, since moved to Sports5 (including TV5, AksyonTV and Hyper on Channel 91 (SD) and 261 (HD) via Cignal) starting January 3, 2016 until December 31, 2018. In Indonesia, UFC events are currently broadcast on tvOne starting January 15, 2018; previously, this events was also broadcast on RCTI , iNews  since 2012 until the end of 2017. Starting Aprll 13 2019 UFC's event will be broadcast on Abu Dhabi Media. ^ Meltzer, Dave (April 8, 2009). "UFC 6: Wild West". Yahoo! Sports. Retrieved December 31, 2011. ^ "UFC Creator Bwb Meyrowitz Announces New MMAPromotion". MMAjunkie.com. January 29, 2009. Archived from the original on July 10, 2012. Retrieved December 31, 2011. ^ a b "WME-IMG Renames Parent Company as Endeavor". The Hollywood Reporter. Retrieved April 19, 2018. ^ a b Kroll, Justin (October 9, 2017). "WME-IMG Renames Holding Company Endeavor". Variety. Retrieved April 19, 2018. ^ "Learn UFC Rules". Ultimate Fighting Championship. Retrieved September 23, 2010. ^ Boice, Danny. "Boxer To Entrepreneur: How Dana White Became The Champ Of Mixed Martial Arts". Forbes. Retrieved May 12, 2017. ^ Stefano, Dan (June 25, 2009). "Former UFC champ helps promote Pittsburgh event". Pittsburgh Tribune-Review. Archived from the original on July 1, 2009. Retrieved June 27, 2009. ^ "Royce Gracie's Legacy, BJJ's Relevance on the Decline in Modern MMA". Bleacher Report. April 27, 2012. Retrieved November 19, 2012. ^ Rooney, Kyle. "UFC sold to WME-IMG". Retrieved October 1, 2016. ^ "Australia tapped an annual UFC destination". MMAjunkie.com. February 20, 2010. Retrieved September 23, 2010. ^ "Dana White on UFC in Abu Dhabi, Afghanistan and GSP vs. Silva". MMA Fighting. Retrieved September 23, 2010. ^ Stupp, Dann (August 29, 2010). "UFC officials announce Asian operations, NBA exec Mark Fischer named head". MMAjunkie.com. Retrieved September 23, 2010. ^ a b "What investor documents tell us about the UFC's past – and its future". MMAjunkie. October 31, 2016. Retrieved May 25, 2018. ^ "Broadcast Yourself". YouTube. Retrieved September 23, 2010. ^ Is This Legal?. Ascend Books. 2014. p. 104. ISBN 978-0-9912756-4-9. ^ Plotz, David (November 7, 1999). "Fight Clubbed". Slate.com. Retrieved March 21, 2007. ^ "UFC History". November 20, 2007. Archived from the original on January 29, 2011. Retrieved January 20, 2008. ^ a b c d e f "Love of grappling defined Jeff Blatnick - Mixed Martial Arts Blog - ESPN". Espn.go.com. Retrieved November 19, 2012. ^ "Lorenzo Fertitta Talks Buying UFC With Fighter's Only Mag". Fighter's Only. March 3, 2009. Retrieved March 27, 2011. ^ "MMA news, fighter profiles and events – Mixed Martial Arts". cbssports.com. ^ Stupp, Dann (May 18, 2007). "Chuck Liddell on "The Best Damn Sports Show" Tonight". MMAjunkie.com. Archived from the original on January 29, 2011. Retrieved September 23, 2010. ^ Trembow, Ivan (July 13, 2006). "Mixed Martial Arts--- UFC's Pay-Per-View Buys Explode in 2006". Ivansblog.com. Retrieved July 2, 2011. ^ a b Doyle, Dave (September 9, 2010). "UFC 40: Signs of life – UFC – Yahoo! Sports". Sports.yahoo.com. Retrieved September 23, 2010. ^ "Flashback to UFC 40: The Shape of Things to Come". MMAMemories.com. Archived from the original on August 11, 2010. Retrieved September 23, 2010. ^ "Punking History". Retrieved September 10, 2016. ^ "Big John McCarthy details early UFC days | Crooklyn's Corner". Crooklynscorner.com. August 23, 2011. Retrieved November 19, 2012. ^ "Mixed Martial Arts". Mmafacts.com. Archived from the original on January 29, 2011. Retrieved September 23, 2010. ^ "Ultimate Fighter moves to FX with live fights on Fox - EW.com". ew.com. ^ "Spike TV Announces Partnership with the UFC Has Ended, TUF 14 Will Be the Last on the Network". MMAWeekly.com. August 18, 2011. Retrieved August 18, 2011. ^ "The 'Ultimate Fighter' Goes Live on FX Starting on Friday Nights in Spring 2012". MMAWeekly.com. August 18, 2011. Retrieved August 18, 2011. ^ Meltzer, Dave. "UFC 52: Chuck strikes back – UFC – Yahoo! Sports". Sports.yahoo.com. Retrieved September 23, 2010. ^ "UFC 61 Surpasses $30 Million in PPV Sales". MMAWeekly.com. September 6, 2006. Retrieved September 23, 2010. ^ Stupp, Dann (January 30, 2007). "Report: UFC 66 Falls Short of 1.2 Million PPV ";Buys";". MMAjunkie.com. Archived from the original on August 18, 2008. Retrieved September 23, 2010. ^ Nelson "Doc" Hamilton. "Marc Ratner UFC Vice President of Government and Regulatory Affairs - Ultimate Grappling Magazine". Web.archive.org. Retrieved February 7, 2019. ^ Meltzer, Dave (September 17, 2010). "Brown-Faber rematch puts WEC at crossroads – UFC – Yahoo! Sports". Sports.yahoo.com. Retrieved September 23, 2010. ^ Goff, Justin (July 11, 2007). "UFC set to surpass boxing in betting revenue". MMAbettingblog.com. Archived from the original on April 10, 2008. Retrieved March 5, 2008. ^ McCray, Brad (July 22, 2007). "Mixed martial arts notebook: Well-traveled UFC president has big plans for the sport". The Oregonian. Archived from the original on January 29, 2011. Retrieved July 22, 2007. ^ "Source: UFC buys Pride for less than $70M". ESPN. March 27, 2007. Retrieved July 2, 2011. ^ Hunt, Loretta (August 26, 2007). "The Fight Network". The Fight Network. Archived from the original on September 26, 2007. Retrieved September 18, 2007. ^ Kotani, Taro (October 5, 2007). "Pride Worldwide Japan Office Officially Closed". MMAWeekly.com. Retrieved October 5, 2007. ^ "Top 10 UFC Fights of 2016 | Best Knockout of Year 2016 | UFC Best Fights". WeirdMag. January 2, 2017. Retrieved January 2, 2017. ^ Thomas, Nick (July 24, 2009). "Exclusive: Major ESPN Executive Attends UFC 100 as a Guest of Dana White". Bloody Elbow. Retrieved September 23, 2010. ^ Iole, Kevin. "'MMA Live' moves to ESPN2 on May 6 – Cagewriter – UFC – Yahoo! Sports". Sports.yahoo.com. Retrieved September 23, 2010. ^ Morgan, John (January 1, 2010). "Despite recent rash of injuries, White says UFC's handling of fighters won't change". MMAjunkie.com. Archived from the original on January 29, 2011. Retrieved September 23, 2010. ^ Meltzer, Dave (September 17, 2010). "Injuries take toll on UFC schedule – UFC – Yahoo! Sports". Sports.yahoo.com. Retrieved September 23, 2010. ^ Thomas, Luke (January 21, 2010). "Brock Lesnar's Career Wasn't the Only Thing in Jeopardy". BloodyElbow.com. Retrieved July 2, 2011. ^ Fowlkes, Ben (May 25, 2010). "'Rampage' Jackson, Rashad Evans and Politics of Race in MMA". MMAFighting.com. Retrieved July 2, 2011. ^ Becker, Nick (June 24, 2010). "Meltzer: UFC 114 Surpasses 1 Million PPV Buys". WatchKalibRun.com. Archived from the original on January 29, 2011. Retrieved July 2, 2011. ^ UFC 116 PPV Buy Rate Estimated At 1.15–1.25 Million. Fightofthenight.Com (July 8, 2010). Retrieved on May 3, 2011. ^ UFC Quick Quote: Brock Lesnar thanks referee Josh Rosenthal after Shane Carwin win. MMAmania.com. Retrieved on May 3, 2011. ^ Kyle, Aiden (July 5, 2010). "UFC 116 Carwin vs Lesnar Fight Results, Fight Card and Highlights". CNMNewsNetwork.com. Archived from the original on January 29, 2011. Retrieved July 2, 2011. ^ Parfitt, Greg (July 4, 2010). "UFC 116: Main Card Review and Fighter Report Cards". BleacherReport.com. Retrieved July 2, 2011. ^ Cain Velasquez MMA Stats, Pictures, News, Videos, Biography. Sherdog.com. Retrieved on May 3, 2011. ^ Giri, Raj (December 7, 2010). "UFC 131 And Fan Expo Weekend Announced for Toronto in April". Fightline.com. Archived from the original on July 11, 2011. Retrieved July 1, 2011. ^ "UFC 131 official for April 30 at Rogers Centre in Toronto". mmajunkie.com. December 7, 2010. Archived from the original on July 11, 2012. ^ a b Pishna, Ken (February 15, 2011). "UFC 129 Gate Receipts Total $11 Million, Eclipse Record". MMAWeekly.com. Retrieved July 1, 2011. ^ McGrath, Stephen. "Conor McGregor Proves Class Disparity, And Deserves UFC Equity | The Huffington Post". The Huffington Post. Retrieved November 22, 2016. ^ "WEC Fighter Salary Breakdown". MMAWeekly.com. January 22, 2007. Retrieved July 24, 2011. ^ "WEC to Make Live Cable TV Debut on June 3". MMAWeekly.com. April 4, 2007. Retrieved July 24, 2011. ^ Hawryluk, Matt. (October 28, 2010) Dana White To Announce UFC Merger With the WEC. Bloody Elbow. Retrieved on May 3, 2011. ^ "UFC-WEC Merger: Reed Harris Proud to See His Baby Grow Up". MMAWeekly.com. October 28, 2010. Retrieved July 24, 2011. ^ "Zuffa purchases Strikeforce". mmafighting.com. March 12, 2011. ^ "Strikeforce targeting summer return for Fedor, fight with Henderson unlikely". mmafighting.com. March 24, 2011. ^ "UFC on Fox 4 ratings: Numbers hold steady for network-televised event". mmajunkie.com. August 7, 2012. Archived from the original on January 28, 2013. Retrieved August 7, 2012. ^ "Final Ratings Off Slightly For UFC on Fox 6". sportsmediawatch.com. February 2, 2013. Retrieved February 2, 2013. ^ "Updated UFC on Fox 7 ratings: 3.7 million". mmapayout.com. April 23, 2013. Retrieved April 23, 2013. ^ "'Strong Gold Cup and UFC Ratings Power Fox Sports". tvbythenumbers. July 30, 2013. Archived from the original on September 5, 2013. Retrieved August 29, 2013. ^ "'Final ratings in for UFC on Fox 9 "Johnson vs. Benavidez II'". mmatorch.com. December 19, 2013. Retrieved December 19, 2013. ^ "TV Ratings: "UFC on Fox 10" Down From Last Year (Also: Local, National NBA)". tvbythenumbers. January 31, 2014. Retrieved January 31, 2014. ^ "Final Ratings: ESPN "Bad Boys" Documentary Premiere Draws 1.8 Million Viewers". SportBusinessDaily. April 25, 2014. Retrieved April 25, 2014. ^ "UFC on Fox 12: 2.5 million viewers". mmapayout.com/. July 26, 2014. Retrieved July 29, 2014. ^ "Ratings report: Dos Santos vs. Miocic Fox show pulls in 2.8 million viewers". mmafighting.com/. December 17, 2014. Retrieved March 14, 2015. ^ "UFC on Fox 14 peaked at 3.65 million viewers". mmafighting.com/. January 27, 2015. Retrieved March 14, 2015. ^ "UFC on Fox Debut Scores Big – Most-Watched UFC Event Ever - Ratings | TVbytheNumbers". Tvbythenumbers.zap2it.com. November 13, 2011. Retrieved November 19, 2012. ^ "UFC CEO Lorenzo Fertitta Says UFC Magazine-Style Show Already in Discussions". MMAWeekly.com. August 18, 2011. Retrieved August 18, 2011. ^ "Ronda Rousey becomes first female to sign UFC deal - ESPN". Espn.go.com. January 1, 2008. Retrieved November 19, 2012. ^ Lau, Eriksson (April 28, 2014). "TUF 20 Tryouts: 36 women vying for 8 spots, Claudia Gadelha and Juliana Lima officially out". BloodyElbow.com. Retrieved March 25, 2016. ^ "UFC Picks Up 11 Female Fighters to Create 115-Pound Women's Division". MMAWeekly.com. December 11, 2013. Retrieved December 11, 2013. ^ Mike Bohn (March 6, 2015). "Tom Wright: UFC 186, plus two more events, on tap for Canada in 2015". mmajunkie.com. Retrieved June 26, 2015. ^ "UFC 129 sets attendance and live-gate records: 55,724 for $12.1 million". mmajunkie.com. May 1, 2011. ^ Staff (April 29, 2014). "UFC returns to Dublin in July". ufc.com. Retrieved April 29, 2014. ^ John Morgan (January 23, 2015). "UFC announces UFC Fight Night 69 in Germany, UFC Fight Night 73 in Scotland". mmajunkie.com. Retrieved June 26, 2015. ^ Dann Stupp (November 12, 2014). "Alexander Gustafsson vs. Anthony Johnson slated for UFC on Fox 14 in Sweden". mmajunkie.com. Retrieved June 26, 2015. ^ Staff (November 12, 2014). "Gustafsson vs. Johnson headlines Stockholm event in January". ufc.com. Retrieved November 12, 2014. ^ Staff (January 23, 2015). "UFC Fight Night 64 heads to Poland with Cro Cop-Gonzaga II, Blachowicz-Manuwa". mmajunkie.com. Retrieved June 26, 2015. ^ Mookie Alexander (March 18, 2015). "Carlos Condit vs. Thiago Alves set as UFC Fight Night main event in Goiania". bloodyelbow.com. Retrieved June 26, 2015. ^ Thomas Gerbasi (March 20, 2015). "Condit comeback begins against Alves in May". ufc.com. Retrieved June 26, 2015. ^ Staff (April 29, 2014). "Viva Mexico – The UFC and TUF head South". ufc.com. Retrieved June 26, 2015. ^ Thomas Gerbasi (February 22, 2015). "Velasquez vs. Werdum Set for June 13 in Mexico City". ufc.com. Retrieved June 26, 2015. ^ Staff (April 7, 2014). "The UFC Comes to New Zealand". ufc.com. Retrieved June 26, 2015. ^ "UFC Fight Night: Hunt vs. Nelson". Ultimate Fighting Championship. Archived from the original on June 26, 2015. Retrieved June 26, 2015. ^ Dann Stupp and Matt Erickson (January 30, 2014). "Date, broadcast info for UFC's return to Abu Dhabi, Roy Nelson vs. 'Big Nog' headliner". mmajunkie.com. Retrieved June 26, 2015. ^ Staff (May 25, 2014). "UFC returns to China with Bisping vs, Le". ufc.com. Retrieved June 26, 2015. ^ Staff (August 29, 2013). "UFC announces Jan 4 for debut event in Singapore". mmajunkie.com. Retrieved June 26, 2015. ^ Staff (January 28, 2015). "UFC Announces First Event in Manila". ufc.com. Retrieved June 26, 2015. ^ Dave Walsh (February 27, 2014). "UFC Issues Statement on Nevada TRT Decision". mmanuts.com. Retrieved February 27, 2014. ^ Barr, John (December 16, 2014). "Fighters claim UFC restricts earnings". espn.com. Retrieved January 5, 2015. ^ John S. Nash (May 14, 2015). "Zuffa files motion to stay discovery of '15 years of Zuffa's financial statements'". Bloody Elbow. ^ John S. Nash (July 29, 2015). "Judge denies UFC's motion to stay discovery in antitrust lawsuit". Bloody Elbow. ^ Wanderlei Silva & MMAFA push for Muhammad Ali Act in MMA. August 3, 2015 – via YouTube. ^ Paul Gift (October 1, 2015). "UFC loses two motions in antitrust lawsuit, full discovery to begin". Bloody Elbow. ^ Paul Gift (November 17, 2015). "UFC lawsuit: Promotion, fighters argue over discovery, 108,000 documents produced". Bloody Elbow. ^ "Sources: The UFC owners in advanced talks to sell business". ESPN.com. ^ "U.F.C. Sells Itself for $4 Billion". The New York Times. Retrieved July 11, 2016. ^ "Dana White on $4 billion UFC sale: 'Sport is going to the next level'". ESPN.com. ESPN Internet Ventures. Retrieved July 11, 2016. ^ "UFC sold to WME–IMG for $4 billion; Dana White will still run day-to-day operations". USAToday.com. ^ "WME | IMG Is Now Endeavor". Billboard. Retrieved April 19, 2018. ^ "UFC Moving to ESPN From Fox in Deal Valued at $1.5B". Broadcasting & Cable. Retrieved May 24, 2018. ^ "What we know about the UFC's $1.5 billion broadcast deal with ESPN". Bloody Elbow. Retrieved May 24, 2018. ^ Hayes, Dade (May 8, 2018). "ESPN Enters The Octagon With UFC Streaming Deal". Deadline. Retrieved May 8, 2018. ^ "Report: ESPN wrestles UFC television-rights deal away from Fox Sports". USA Today. Gannett Company. Retrieved May 23, 2018. ^ "Report: ESPN lands UFC television rights deal, reportedly worth $150 million per year". Bloody Elbow. Retrieved May 23, 2018. ^ "ESPN Extends With UFC; ESPN+ Becomes Exclusive PPV Provider". Sports Business Daily. Retrieved March 18, 2019. ^ Sherdog.com. "M-1 Challenge Announces Partnership with UFC to Focus on Russian MMA Talent". Sherdog. Retrieved July 21, 2018. ^ "UFC signs with oldest Russian MMA promotion for 'UFC RUSSIA' development program". RT International. Retrieved July 21, 2018. ^ "Russian MMA promotion M-1 announces deal with the UFC | BJPenn.com". | BJPenn.com. July 18, 2018. Retrieved July 21, 2018. ^ "UFC confirms partnership with USADA, details of out-of-competition testing program". MMAjunkie. June 3, 2015. Retrieved September 29, 2018. ^ "UFC changes policy on when it announces failed drug tests". MMA Fighting. Retrieved September 29, 2018. ^ Mixed Martial Arts Unified Rules of Conduct, Additional Mixed Martial Arts Rules Archived April 3, 2009, at the Wayback Machine, New Jersey Athletic Control Board. Retrieved April 3, 2006. ^ "The Octagon™ - Get Inside". Archived from the original on August 28, 2018. Retrieved January 20, 2016. ^ UFC 62: Streaming en Espanol Archived November 15, 2006, at the Wayback Machine. The Boston Herald. July 30, 2006. Retrieved August 4, 2006. ^ Kristian Ibarra. "The Pros and Cons of Fighting in a Smaller UFC Octagon". Bleacher Report. ^ "The Hard Numbers on the Small UFC Cage (Part 1)". ^ "Rules and Regulations - Unified Rules and Other MMA Regulations". ufc.com. ^ "Mixed Martial arts Unified Rules of Conduct". New Jersey State Athletic Control Board. September 5, 2002. Archived from the original on April 3, 2009. Retrieved May 19, 2011. ^ a b c d John Morgan (December 2, 2014). "UFC partners with Reebok for uniform program; rankings to determine fighter pay". mmajunkie.com. Retrieved December 3, 2014. ^ Steven Marrocco (April 20, 2015). "UFC: Fighter rankings will no longer determine Reebok sponsorship pay". mmajunkie.com. Retrieved April 20, 2015. ^ Staff (June 30, 2015). "What you need to know about new UFC-Reebok 'fight kit' uniforms and gear". mmajunkie.com. Retrieved June 30, 2015. ^ MMA rules explained. Archived June 15, 2006, at the Wayback Machine Nevada State Athletic Commission. Retrieved June 30, 2006. ^ "Ivan's Blog--- Ivan Trembow's Self-Important, Random Rants on Mixed Martial Arts, Video Games, Pro Wrestling, Television, Politics, Sports, and High-Quality Wool Socks". ivansblog.com. ^ Bishop, Matt (July 20, 2011). "UFC 138: Chris Leben, Mark Munoz to Meet in First 5-Round Non-Title Fight". BloodyElbow.com. Archived from the original on August 23, 2011. Retrieved August 22, 2011. ^ a b "Rules and Regulations – Unified Rules and Other MMA Regulations". UFC. Archived from the original on January 5, 2018. ^ "Joanna Jedrzejczyk shocked at UFC 223 loss to Namajunas, tells other strawweights: 'Bow down'". MMAjunkie. April 8, 2018. Retrieved August 6, 2018. ^ Jr, Adam Guillen (January 7, 2019). "Rose Namajunas Vs Jessica Andrade Title Fight Set For UFC 237 On May 11". MMAmania.com. Retrieved January 8, 2019. ^ "Demetrious Johnson vs. Henry Cejudo 2 booked for UFC 227". MMA Fighting. Retrieved August 6, 2018. ^ "Valentina Shevchenko defeats Joanna Jedrzejczyk". MMA Fighting. Retrieved December 9, 2018. ^ "Valentina Shevchenko makes first flyweight title defense at UFC 238 in Chicago". MMAWeekly.com. March 11, 2019. Retrieved March 15, 2019. ^ "Henry Cejudo vs. Marlon Moraes official for UFC 238". MMA Junkie. March 27, 2019. Retrieved March 28, 2019. ^ "Raquel Pennington wanted UFC 224 fight stopped after fourth, but corner talked her out of it". MMAjunkie. May 13, 2018. Retrieved August 6, 2018. ^ "Jones-Santos, Nunes-Holm to headline UFC 239". ESPN.com. March 27, 2019. Retrieved March 28, 2019. ^ "UFC 231 results: Max Holloway overwhelms Brian Ortega". MMA Fighting. December 9, 2018. Retrieved December 9, 2018. ^ "Amanda Nunes Makes History With A First-Round Knockout Win Over Cris Cyborg At UFC 232". Forbes. December 30, 2018. Retrieved December 30, 2018. ^ "UFC 223 results: Khabib Nurmagomedov dominates Al Iaquinta to become new lightweight champ". MMAjunkie. April 8, 2018. Retrieved August 6, 2018. ^ "UFC 229 results: Khabib Nurmagomedov taps out Conor McGregor, brawl ensues". MMAjunkie. October 7, 2018. Retrieved October 7, 2018. ^ "UFC 228 results: Tyron Woodley drops Darren Till, defends belt with second-round D'Arce choke". MMAjunkie. September 9, 2018. Retrieved September 9, 2018. ^ "NZ-born Robert Whittaker makes UFC history by beating Cuban Yoel Romero". Stuff. Retrieved August 6, 2018. ^ "Jon Jones KOs Alexander Gustafsson to win UFC light heavyweight title, Amanda Nunes dismantles Cris Cyborg". Fox Sports. December 29, 2018. Retrieved December 30, 2018. ^ "UFC 226 results: Daniel Cormier knocks out Stipe Miocic, cements himself as all-time great". Bloody Elbow. Retrieved August 6, 2018. ^ "UFC Aftermath: Trying to Understand the "Angry Watching" Phenomenon". The Province. April 14, 2015. Retrieved October 31, 2016. ^ Iole, Kevin. "Dana White says business is booming, will have $175 million economic impact in Las Vegas this week". Yahoo! Sports. Retrieved October 31, 2016. ^ "Live Chat: UFC Fight Night weekend preview, GLORY 17 recap, over saturation debate". YouTube (MMAFighting.com official channel). June 25, 2014. Retrieved October 31, 2016. ^ Raimondi, Marc (March 11, 2015). "ONE CEO: Goal is to put on 50 shows per year". MMA Fighting. SB Nation (MMAFighting.com). ^ Schlinsky, Alex (November 15, 2014). "UFC 180 Details: Who is Fighting, When And Why". SB Nation (MMAmania.com). Retrieved October 31, 2016. ^ Wyman, Patrick. "How the UFC Has Done More with Less in 2015". Bleacher Report. Retrieved October 31, 2016. ^ "UFC's Oversaturation and Overcommitment Problems". www.mmanuts.com. April 20, 2014. Retrieved October 31, 2016. ^ "MMA: Are too many shows watering down the sport?". www.FanSided.com. July 17, 2014. Retrieved October 31, 2016. ^ Joe Rogan: Information from. Answers.com. Retrieved on May 3, 2011. Reynolds, Robert. "UFC announcer Mike Goldberg goes from pucks to punchouts". MMADieHards.com. "UFC commentator Mike Goldberg leaving the promotion following UFC 207". MMAFighting. Retrieved December 29, 2016. ^ Hackler, Tracy (August 27, 2010). "MMA's Bruce Buffer Makes a Name for Himself". ESPN Page 2. Archived from the original on April 7, 2011. Retrieved September 16, 2010. ^ Borges, Ron (August 29, 2010). "Cutman has made mark". Boston Herald. Archived from the original on September 1, 2010. Retrieved September 16, 2010. ^ Kid Nate (September 3, 2010). "How the UFC Books Fights". Bloodyelbow.com. Retrieved September 16, 2010. ^ "Conor McGregor Breaks Brock Lesnar's Record for Biggest Fight Purse at UFC 202". BleacherReport.com. ^ Dave Walsh (February 11, 2014). "UFC Eliminates KO and Submission of the Night Awards". mmanuts.com. Retrieved February 11, 2014. ^ "UFC Post-Fight Bonuses Now Set at $15,000 for Every Event". MMA Weekly. March 14, 2013. Retrieved April 13, 2013. ^ "UFC 100 fighters salaries: Lesnar and St. Pierre get top paydays in $1.8 million payroll". MMAjunkie.com. Archived from the original on July 15, 2009. Retrieved July 13, 2009. ^ Zwick, Jesse (May 30, 2012). "No Holds Barred: Labor turmoil in the world of mixed martial arts". The New Republic. Retrieved May 30, 2012. ^ Damon Martin (March 19, 2019). "Dana White: 'I'm ready for the Diaz brothers' to return but they don't accept fights". mmaweekly.com. ^ a b "UFC Denver results: Donald Cerrone sets UFC records with win over Mike Perry". MMA Fighting. Retrieved November 11, 2018. ^ Round 5 – The Official UFC Collectible. Round5mma.com. Retrieved on May 3, 2011. ^ "Jakks UFC Octagon Official Scale Playset MMAFigs.com". Retrieved June 21, 2009. ^ "UFC Series Zero Action Figure Prototype Images MMAFigs.com". Retrieved June 21, 2009. ^ "UFC Series 1 Action Figure Prototype Images MMAFigs.com". Retrieved June 21, 2009. ^ "UFC Deluxe series 2 prototype pics out!". The Fight Nerd. November 2, 2009. Archived from the original on September 4, 2012. Retrieved November 19, 2012. ^ "WWE Toys, Wrestling Action Figures, Jakks Pacific, Classic Superstars Action F: UFC MMA Exclusives". Ringsidecollectibles.com. Archived from the original on November 23, 2012. Retrieved November 19, 2012. ^ "Xbox Live's Major Nelson » UFC on Xbox LIVE launching December 1 :". Majornelson.com. October 7, 2011. Retrieved November 19, 2012. ^ "UFC Fight Pass on Twitter". Twitter. ^ "UFC and Fox Sports Asia announce broadcast partnership renewal". UFC. Retrieved September 22, 2018. ^ "Cignal gets rights to air UFC fights live as Balls Channel announces it is going off the air". Spin.PH. December 21, 2015. Retrieved April 10, 2016. ^ "UFC, Cignal, TV5 seal broadcast deal". Spin.PH. December 30, 2015. Retrieved April 10, 2016. ^ "3 Duel UFC yang Disiarkan tvOne, Senin 15 Januari 2018 – Viva" (in Indonesian). January 11, 2018. Retrieved September 22, 2018. ^ "UFC announces partnership with MNC Media in Indonesia, plans future events". MMAjunkie. November 10, 2012. Retrieved September 22, 2018. ^ "Abu Dhabi Media, UFC announce new broadcast partnership". wam. Retrieved April 11, 2019.